Asparagus is quite expensive in Hong Kong throughout the year. 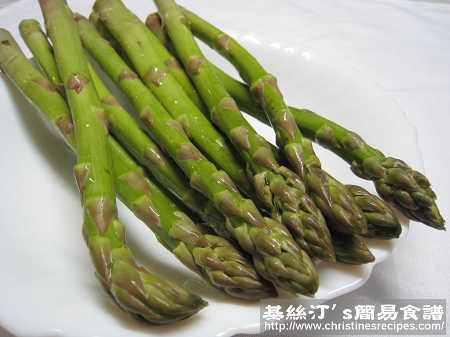 I still can remember that a plate of blanched asparagus might cost a fortune in some Chinese restaurants. Luckily, I can easily find beautiful and fresh asparagus when they are in season in Australia. 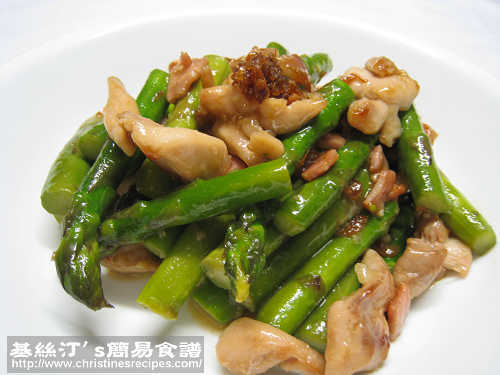 Asparagus could go very well with chicken. 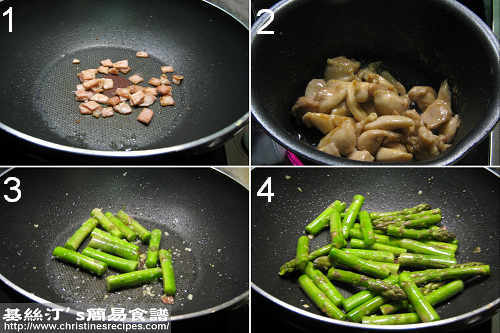 This dish, stir-fried asparagus was also enriched with the flavour of diced bacon. Yummy! Rinse asparagus and drain well. Cut into about 5cm (2 inch) lengths and put the thicker sections apart from the thinner ones. Marinate chicken for 20 minutes. Roughly chop bacon. Heat oil in wok or pan over medium heat. Cook bacon until golden brown or crisp if desired. Transfer on paper towels to absorb excess oil. Add chicken in wok. Stir fry until cooked, about 3 minutes. Add some oil in the same wok, sauté garlic over medium-high heat. Toss in the thicker sections of asparagus as they need more time to cook. After stir-frying for a while, add thinner sections. Stirring occasionally. Sprinkle wine. Add stock and cook until sauce dries up a bit and the asparagus is cooked. Yet don’t overcook them, lest they turn yellow. Toss back chicken and bacon. Add thickening and XO sauce. Quickly stir and combine well. Done! I love asparagus especially this recipe, but not my kids. Nowadays, children do not like to take green vege as much as we do! When I stir fry veggies with some meat and stock, it seems that my daughter can eat more veggies than usual. YUM - that looks and sounds amazing! MMMMMMMMM,...what a lovely green asparagus dish: just so yummie! I love stir-fried greens, yummy.